John J. Pavao for mayor, 1928. There are three of us running as Republicans. One of us is attached to sugar, and the sugar owners will ever more be his boss; another of us is in a higher class than us, and those of that class will be his boss should he win; as for me, I am of your class, and all of you will forever be my boss; and so who will you choose this coming October 6th? Will it be those out of your class, or will you select the one from your class? I have faith and confidence that you and all of those of our class will choose me as a MOSES who will deliver this lahui from the burdens of Egypt, and our homeland, beloved Hawaii will come into MILK AND HONEY. Beloved is the land of our birth along with her ridges and rivers, and above all, my fellow makaainana who were troubled all these many past years. My victory will be a victory for us all; their victory will perhaps be our downfall. Don’t forget to mark my name so that I become a MOSES for us all. We are weak, but by standing together, we will be victorious; therefore all ohana work together and vote for J. J. PAVAO as your candidate for mayor. Strong winds on Niihau, 1868. Strong Winds.—M. 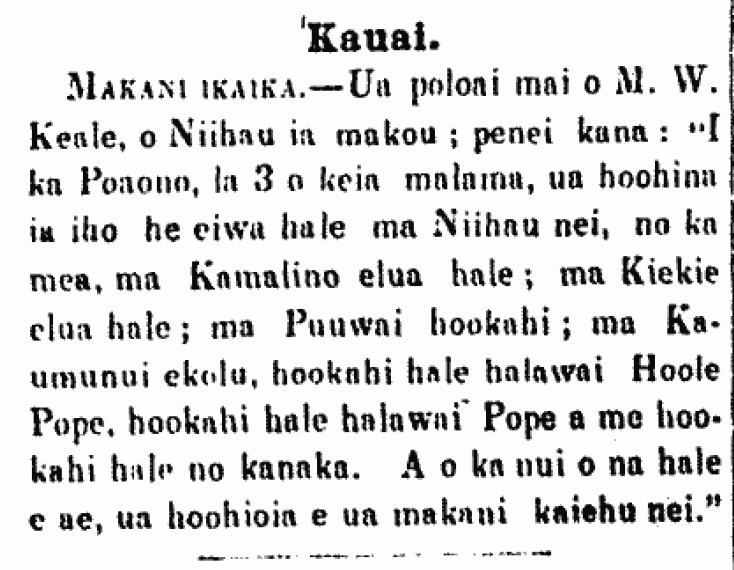 W. Keale of Niihau told us that on the 3rd of this month, toppled over were nine buildings on Niihau, for there were two in Kamalino; two in Kiekie; one in Puuwai; and three in Kaumunui, one being a Protestant meeting house, one a Catholic meeting house, and one a private residence. And most of the other houses were tilted to the side by the dirt-stirring winds. 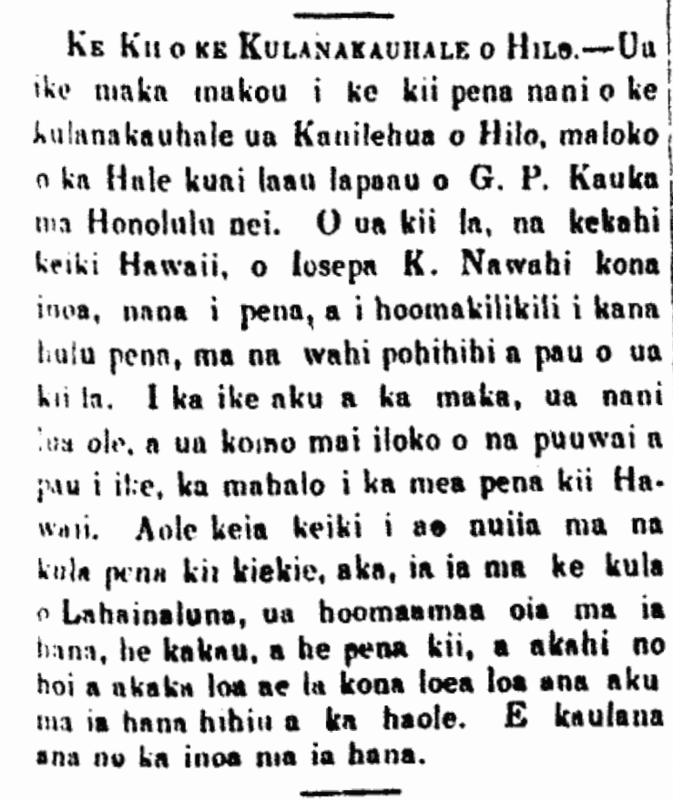 Ka Nupepa Kuokoa, Buke VII, Helu 43, Aoao 3. Okatoba 24, 1868. Mark A. Robinson runs for senator, 1928. The candidate for senator for the good of Hawaii and Hawaiians. I was born in our beloved land, and aloha for my homeland and her makaainana, my fellow people, lives within me; and should I win, this aloha will never go away, for love can never be severed by great floods. I will always try my utmost to obtain fair laws for us all, and to always oppose all biased laws. Ke Alakai o Hawaii, Buke 1, Helu 23, Aoao 3. Okatoba 4, 1928. 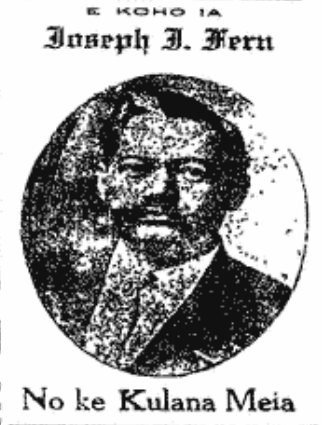 Joseph Fern for Mayor, 1914. Ka Holomua, Buke II, Helu 1, Aoao 1. Okatoba 3, 1914.